Next stop, we were at Uluwatu ! Now this is the place for Sunset View !!! Then we took a path way to see the awesome sunset view! And also the beautiful cliff view. First time of my life, I yet to meet any similiar view in Malaysia before. Then, all of us took turn to snap photos to leave marks at this beautiful place. I was told when snapping someone from top view, they may look thinner. 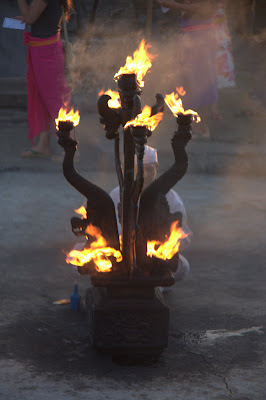 The place shown in the photo below, is the place for Kecak Dance at night. Also the place where we heading to next. Was a bit boring though, thanks to the stupid Japanese sat behind us that day. This is the starting part of the "Kecak Dance"
Met some Asian girls, assumed to be Japanese Girls. After some rest....we yet to call it a night and we started our journey again in this beautiful island. Our models have changed their clothes with some beautiful piece of cloth! Bintang Beer ? Tried it and feel Heineken Beer more worth. Reena really can drink a lot! So does WC ! Last station, McD before we heading to bed. The chilli sauce tastes weird......Still prefer the one in Malaysia. Home sweet home eh? Was watching Wimbledon Open 2009 Semi-final. Andy Murray vs Andy Roddick!! !